As a kid growing up, there were all sorts of dress 'codes' that were strictly adhered to. There were certain colours you just never, ever wore together. Red heads never wore pink. You never wore white shoes after Labour Day or before Victoria Day. Or maybe that was Easter. Your hand bag and shoes had to be the same colour, etc. When I was about 14 or 15 I paired a bright apple green skirt with a deep blue/teal sweater. When I went to meet my school mate to walk to school, she berated me for wearing blue and green. Horrors! What had I been thinking? Blue and green were never, ever seen together! She wasn't impressed with my logic. Of course all that went out the window during the swinging '60's and Mary Quant et al. 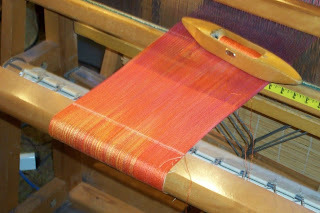 And today this pink/orange/red/yellow warp flames into being on my loom. I think it is Thomas Edison who is credited with the saying that creativity is 1% inspiration and 99% perspiration. This is very true when you are a production weaver making a 'line' for sale. Almost all of the creativity is in the proving of the concept. Once you've got the textile as 'perfect' as you can get it, the rest is all perspiration. And I do mean that literally. Right now I am almost 3/4's of the way through my initial run of the new scarf design. 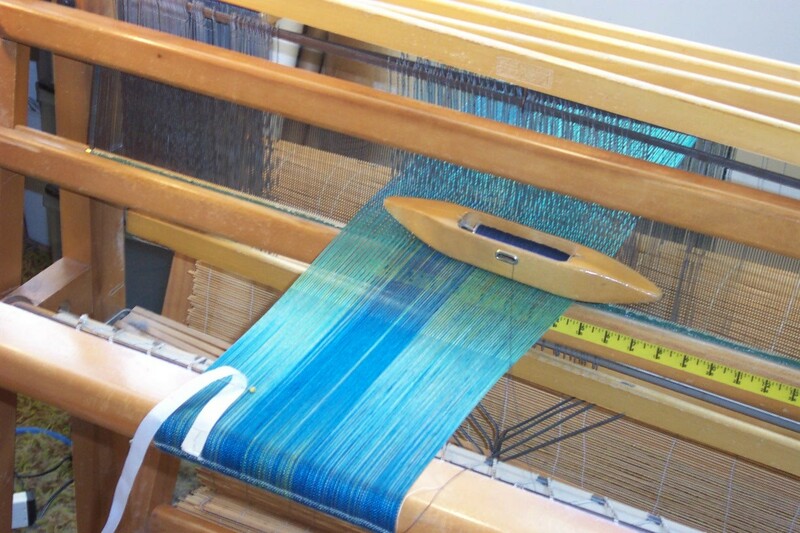 The only 'creativity' at this point in time is choosing the best weft colour to set off the warp colours. 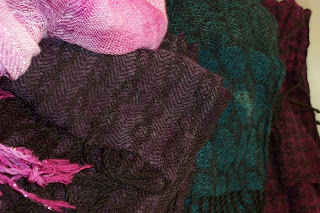 The rest is just showing up in the studio, every day, for several hours, and picking (pun alert) my way through the 4 scarves that can be woven on each warp. People often ask me if I get bored. The honest answer is that I don't. I do get tired, however. And I admit that after the daily slog of the past weeks I am getting tired. Tired enough that I am really glad I scheduled another trip in August, even though I can't really afford it (financially or in terms of time off work). As it happens I am going to be visiting with three family/friends, one of which I haven't seen for over a year, another who recently moved, and the third who has been a great inspiration. I am also looking forward to a potential face to face meeting with someone with whom I may be working much more closely in the coming year. Which would be fantastic, given all those empty pages in my 2014 calendar! Tomorrow I will be receiving 8 more painted warps which will help fill in some of the colours I felt were 'missing' from the first couple of dye runs. I won't get them all woven before I leave but I will do as much as I can with the time remaining before I leave, and the rest will get woven asap I get home. And then I will be able to work on something completely different. People sometimes comment to me about how fast/productive I am. Well, part of the productivity is how many hours a day I spend at the loom. This is my job. I have spent countless hours practicing, fine tuning, honing my physical skills. 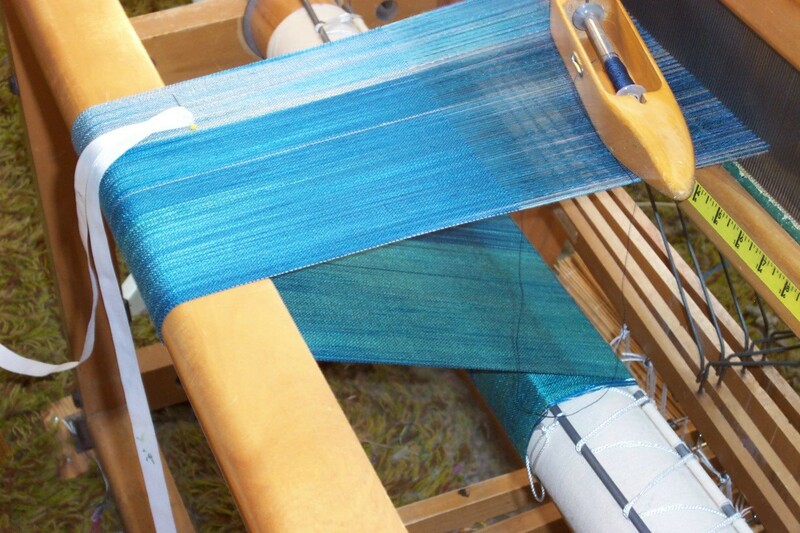 Because make no doubt about it, weaving is a physical activity. It is bio-feedback. It is aerobic. It is physical. 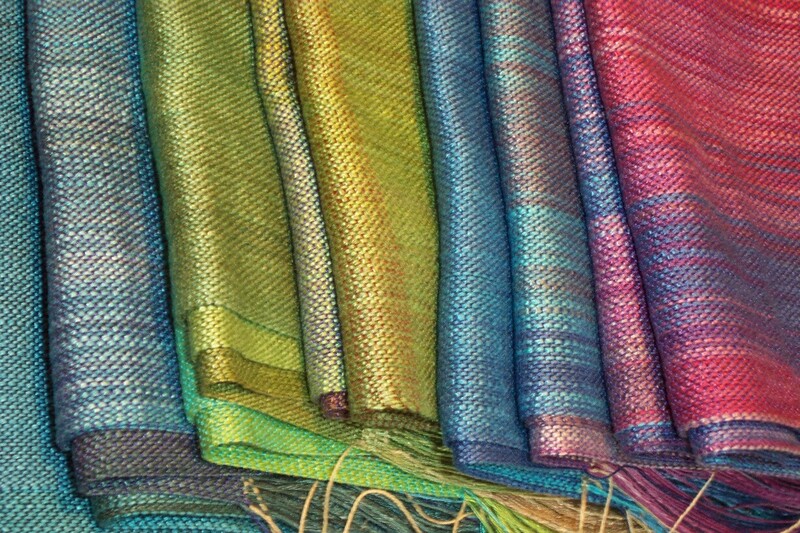 Weaving is a relationship between the equipment, the materials and the weaver. That relationship is like any other. You have to devote time and energy to it. If you really want to get better and/or faster at the creation of cloth, a commitment needs to be made. People keep telling me that they have no time. We each get the same allotment of 24 hours in a day. It is up to us how we spend that time. 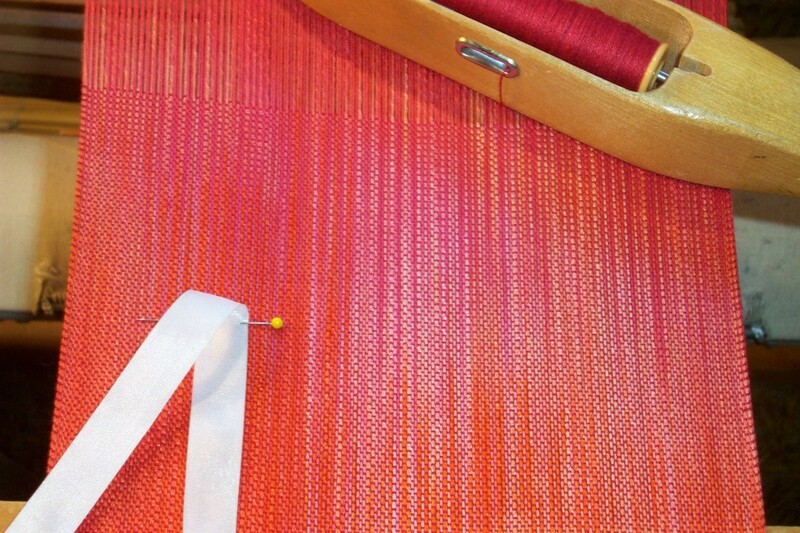 Try making a commitment to yourself of 15 minutes a day doing something related to weaving. It might be watching some video clips on You Tube. Reading a blog. Looking at magazines or websites. It might be spending 15 minutes at the loom. So you only managed to thread an inch in 15 minutes. It's an inch more than you had before. You only managed to weave 2 inches? It is two inches more than you had before. Try leaving your every day woes and cares outside of your loom space. Focus on what you are doing instead of your most recent familial or work crisis. Clear your mind of the stress of every day living and just be a weaver for 15 minutes a day. Then once a week, schedule 2 to 3 hours of quality time with your loom. Time where you can really focus on developing your skills as a weaver. Allow yourself to experiment and find out what happens when you change this or that. Then don't label it a 'failure' but an experiment. Analyze your results. Do you like them? Repeat them. Don't like them? Make a note that you won't do that again and call it a lesson. 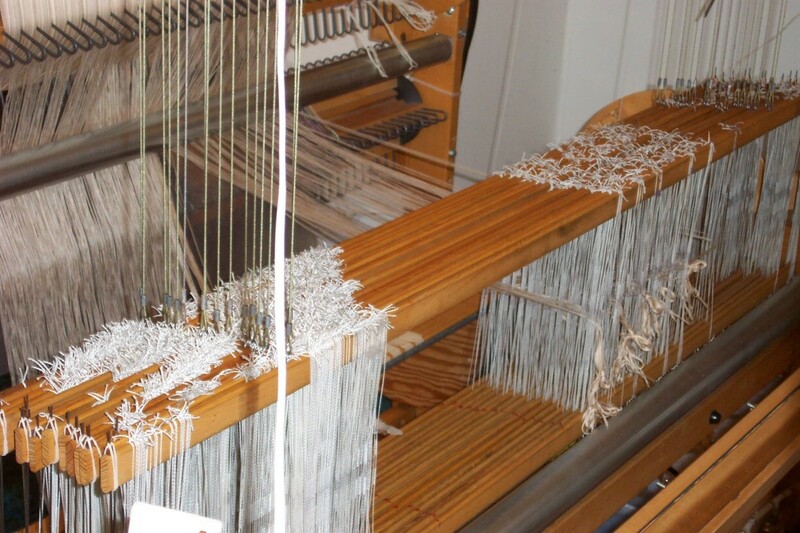 If your life is so very crammed with other stuff that you have none to spare, try making the time at the loom a form of therapy - it's a lot cheaper! And if your time is so limited, learning how to work more efficiently/ergonomically will mean more productivity during the time you do have for weaving. People often comment to me that they don't want to 'hurry'. Weaving more efficiently has nothing whatsoever to do with 'hurrying'. Hurrying is when your mind is focused on what you are going to do next, not on what you are presently doing. People ask me what I am going to do when I 'retire'. I tell them that people don't 'retire' from the work that they love. They may do less of it, they may change their approach or their focus, but they don't 'retire'. One of the ways I measure productivity is by crossing things off a list of jobs to be done. But just because I haven't been crossing stuff off my list doesn't mean that I haven't actually been rather productive since I got home from Sweden. 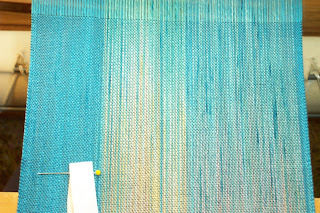 In addition to the 33 warps already woven, I also dealt with a great deal of administrivia, including doing 3 months worth of journal entries and submitting my sales tax return, updated my Power Point presentation for Weaving Today, did some fringe twisting and got Doug to do some pressing which meant running the textiles through the washing machine and dryer. Not to mention being away for a week, twice! But I still can't cross that "Weave 36 scarf warps" off my list. 11 weeks to the first sale of the autumn and counting. 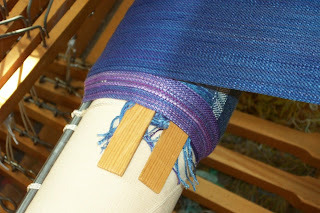 One of the things I am trying to do with these painted warps is to use up odds and sods of yarn in my stash. When I came to this warp I decided I'd use up a medium brown Bambu 12, positive that there would be sufficient to weave a scarf. No such luck. :( I could see that I was going to run out about 2/3's of the way and started casting around for an option. Because a scarf 2/3's of it's intended length wasn't going to fit anyone but maybe a toddler. Not having any toddlers in my life I wanted to give a hand woven scarf to, I needed an alternative. 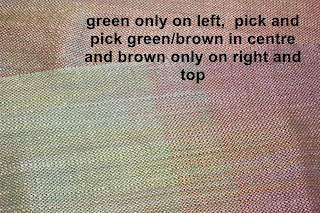 When the bobbin was almost empty I started weaving pick and pick with a yellow/green about the same value - a little lighter but close. When the brown ran out I carried on with the green. Doug did some more pressing yesterday and last night I began the final step in bringing my scarves to, in my opinion, saleable condition. You don't have to do as I do. Trimming the wispy bits off the ends of the fringe is purely a personal choice kind of thing. A final step that takes some time to do and isn't, in some people's minds, necessary. Some people question whether or not the knots will hold once they have been trimmed. All I can say is that I've not had a customer complain. Yet. And my own scarves (lightly worn, it's true) show no signs of the knots not holding. To me, trimming the fringes makes them look tidy. Neat. Hopefully worth the price I'm going to be putting on them for sale. Nearly 40 years after making the decision to become a professional/production weaver I'm still wondering how someone who needs as high a level of 'security' as I want chose a profession with so little! 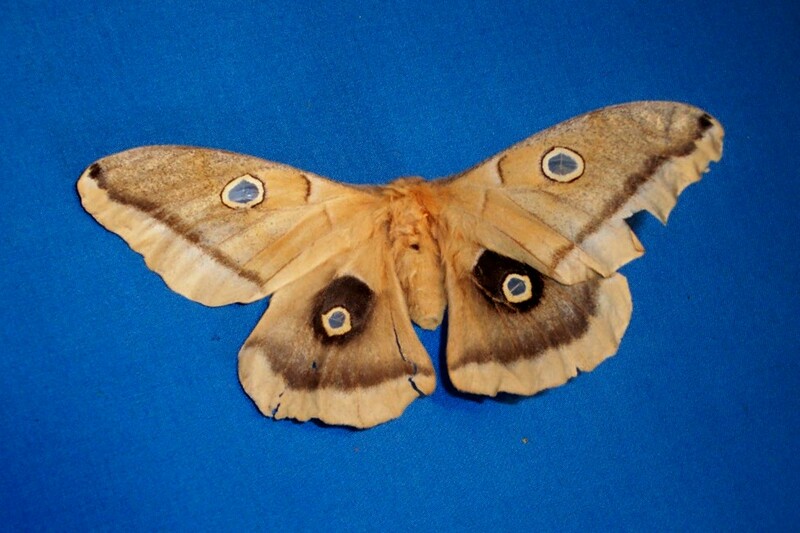 Antheraea polyphemus, a.k.a., a "giant silk moth." I am going to go out on a limb here and give a little more information about the webinar I am scheduled to do for Weaving Today later in August. 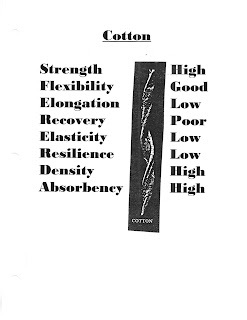 The topic is A Good Yarn and it will present information on fibre and yarn characteristics. 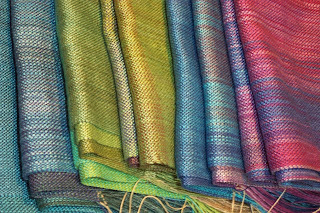 It is my belief that, in order to make good choices, weavers need to understand more about the inherent characteristics of their materials. If a weaver does not choose wisely or well, they may be disappointed in their results. So I have spent the last few days upgrading the Power Point presentation that I have been giving to guilds and at conferences to make it more eye appealing for its debut on the internet. The above photo is one I took this morning to illustrate the silk page. It is one of the silk moths native to North America. No, it is not a Bombyx Mori, from which we get 'cultivated' silk. But that is not the only species which spins a silk cocoon. As soon as I get the go ahead, I will post the registration information here. If you have already taken this topic from me, you might find this a good refresher with the added benefit that you will have unlimited access to review it once it is posted on the website - for 3 months. Always wanted a re-wind on life? This may be your chance! There is a poster on Facebook that says "Life is too short to (knit, weave, crochet) with cheap yarn." I agree. But define 'cheap'? One of the main complaints of new weavers is that weaving is so expensive - the yarn costs so much. OTOH, when I look at yarns for knitting, my thought is "that's so expensive!" When you look at what you are getting for your money, there can be quite a large difference in cost per ounce, knitting vs weaving yarns. 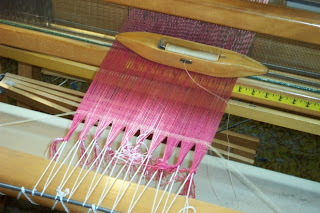 The thing is, weaving just uses up way more yarn so the initial outlay may seem as though it is more expensive. Instead of one skein of 100 grams of knitting yarn for, say, $25 a new weaver may buy 3 or 4 tubes (8 ounce tubes) for more than that. But compare the weight and yardage. Generally speaking, cost per ounce for weaving yarns is a lot less than for knitting or crocheting. So what is a 'cheap' yarn? Are we talking inexpensive? Or poor quality? The word 'cheap' can be defined as either. My approach to weaving has been to work with the best quality yarns I can afford. So no, I don't buy the acrylics commonly available in Michael's or Wally World. I go to weaving yarn suppliers. I examine the way the yarn has been spun. Test it for strength. For integrity in the loom as warp. If you look closely at the photo above (click to biggify) you will see two skeins of 2/8 or 8/2 cotton yarn. Can you see the difference between them? That one looks whiter and smoother than the other? 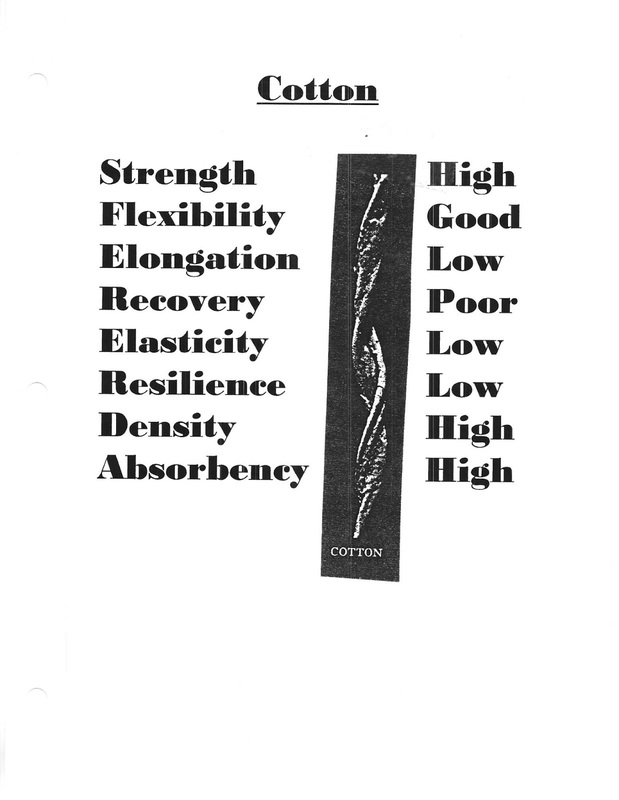 Ring spun cotton is more like a worsted preparation while open end spinning is more like woolen preparation. The ring spun yarn is smoother and stronger (by about 20% according to industry) than open end spun yarn of the same fibre. 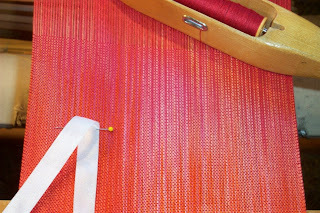 My approach to weaving (I've said before and I'll say it again, no doubt!) 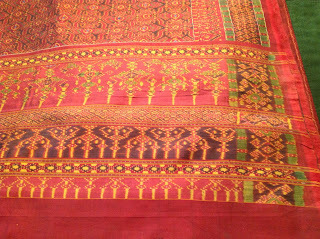 is that the most expensive component of a hand woven textile is the time the weaver invests in creating their textile. 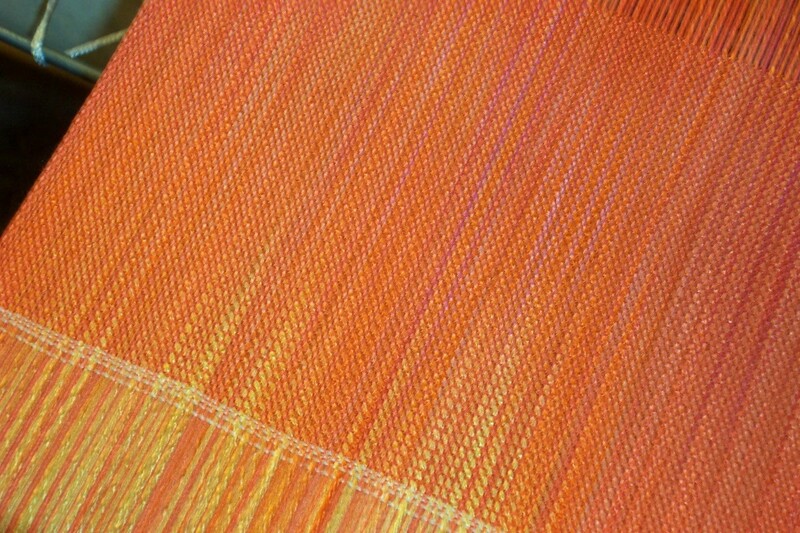 Why would I work with materials that can't stand up to the stresses of weaving? My preference for warp is a stronger yarn. The weaker yarn belongs in the weft. IMHO. Learn more about the inherent qualities of the yarn you are working with and make appropriate choices. Watch this space for more information on my up-coming webinar with Weaving Today on just this topic. The painted warps are 10.5 meters long, yielding 4 scarves. 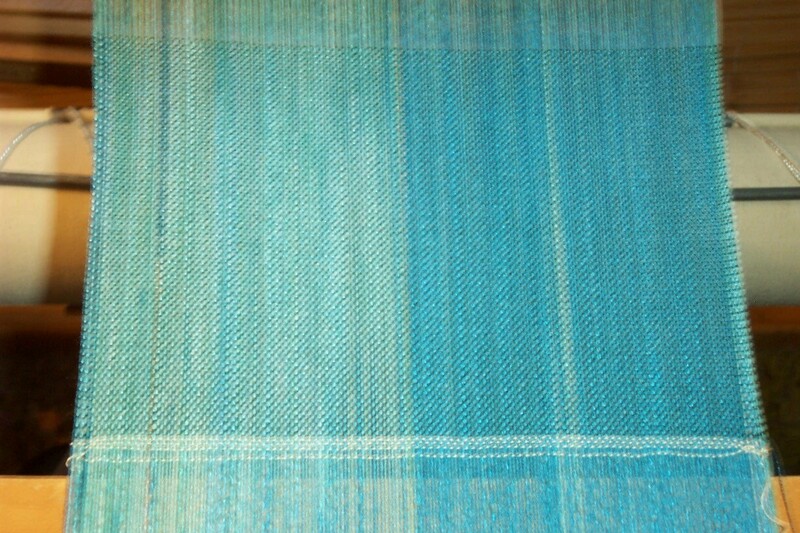 Apparently I did a sloppy job somewhere along the line getting this one into the loom. A) Cut off what has already been woven and re-tie. B) Insert sticks to provide a solid foundation for the cloth to wind onto. Since I am half way through scarf #3 cutting off is not an option, so I simply inserted sticks as I continued to roll onwards. 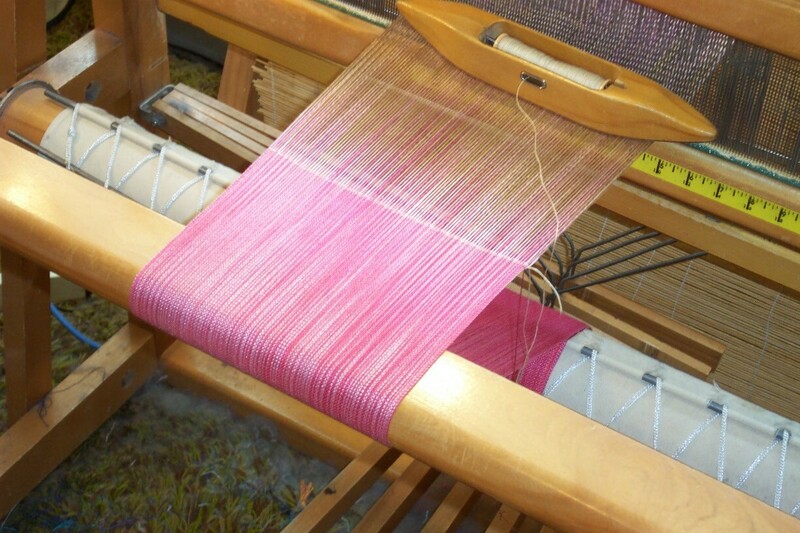 A) The weaver has been weaving a twill weave structure and then switches to plain weave. 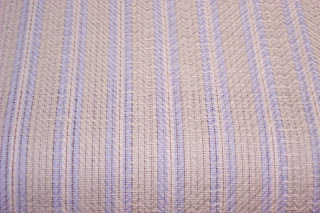 Since plain weave does not draw in as much as twill, the selvedges will be hanging over open air and eventually both selvedges will loosen. B) The weaver changes to a thicker weft. Again the cloth will not draw in as much as previously and both selvedges will hang over open air. When I am switching weave structures and/or thickness of weft, I try to weave the wider cloth first. But if that isn't possible, inserting sticks will often times do the trick. It seems as though there are days when controversy rears its head. Most days I can hit 'delete' or 'next' and not pay too much mind. But other days? 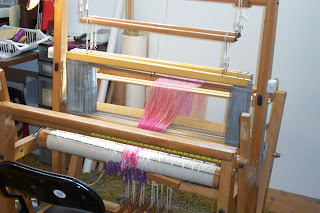 My first introduction to weaving heresy was when I ordered my AVL Production Loom. The hue and cry that went up! Then when I added the Compu-Dobby - a computer assist was once again 'cheating'. And again when I added the air assist. But the weaving community has other factions, too, one of the main ones being whether you dress the loom back to front or front to back. Another is which resources that get recommended. I used to think I knew the correct answer to the latter two. (I already knew the correct answer - for me - for the first three.) I gradually came to realize that the correct answer to which process and resources were used was as much up to the individual as my choice to go with a much more mechanized loom. The only correct answer was the one that was correct for me. But the controversy rages, especially on the chat groups. I don't know if it is just that much easier to be abrupt in a written media. After all, you don't hear tone of voice or get to see body language. It is easier to take offense...and give it...when all there is to go on is the text. But I'm tired of it. It's devisive in a craft that is already struggling to stay alive and attract new practitioners. 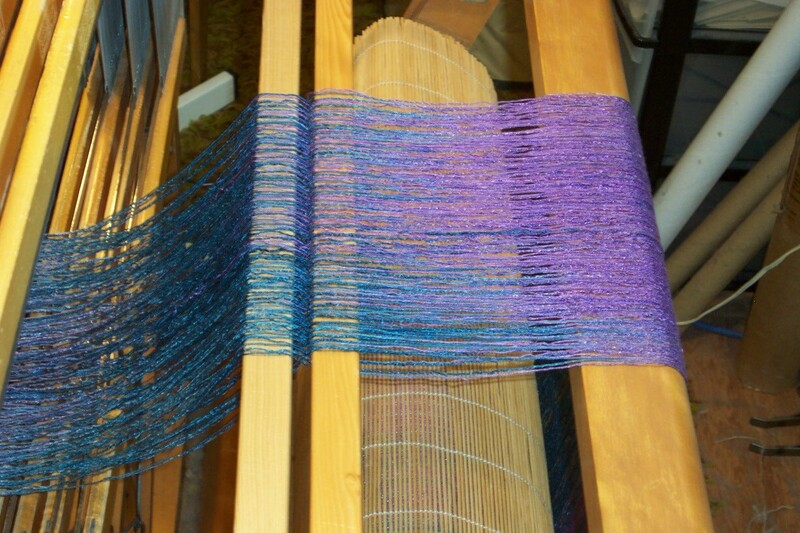 How welcome does someone who has a rigid heddle loom feel when the 'old guard' denigrates their loom? 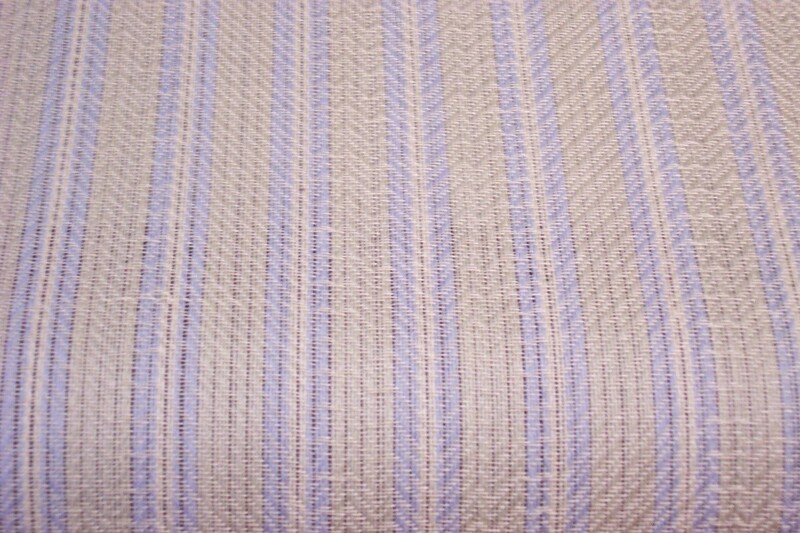 About as welcome as I felt when I was told I could no longer call my textiles hand woven if I wove them on an AVL. But I am perhaps more stubborn than most and I stuck it out. I carried on with my plans, doing what I knew was right for me, even though the criticism stung. I didn't let other people's opinions stand in the way of my goals and heart's desire. So I tell my students - If you are happy with your results, you don't need to change a thing. But if you aren't happy? Learn other methods. Learn about other tools. Learn how to make it work for you. Learn as much as you can from as many people as you can. Choose your expert. Learn enough to become your own expert. And yes, I prefer back to front. Didn't stop me from recommending front to back to a student when it was the appropriate thing to do. One of the benefits of travelling is getting to meet and know people that I would ordinarily never have the opportunity to meet. Some people have lived very adventurous lives in far flung locations, while others have made their lives much closer to their home bases. It is always a treat to get to know more about the interesting ways textiles have impacted on people. So it was when I met Winnie. She had lived and worked for a time in Asia and been entranced with the textiles she saw in the different cultures, eventually creating a collection of different cloths - ikats, warp, weft and compound (warp and weft) as well as batik in various forms. 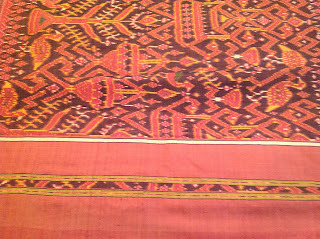 She invited me to come and visit for a few days so I could see some of the amazing textiles she had found. Arriving a few days early for the conference also allowed me to re-set my body clock - three hours doesn't seem like a lot, but I've found that it makes a huge difference in terms of when I naturally fall asleep! 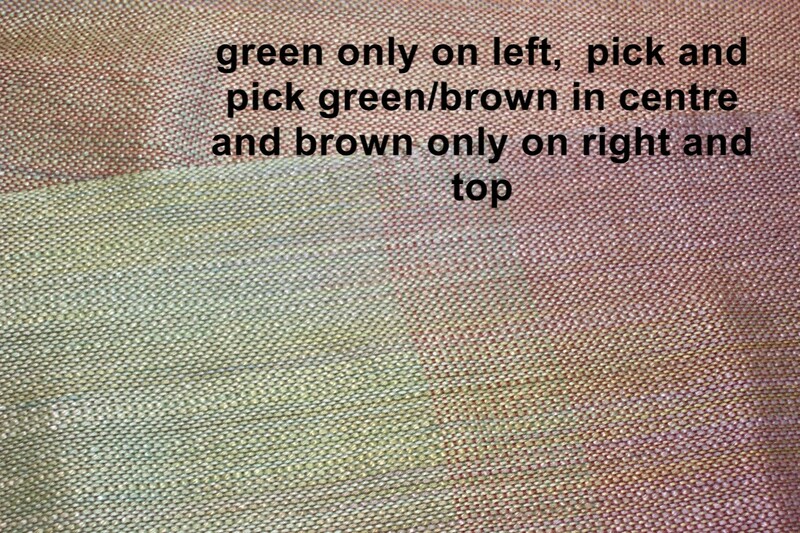 If I remember correctly the first four photos are all ikats of one type or another; the last is batik. 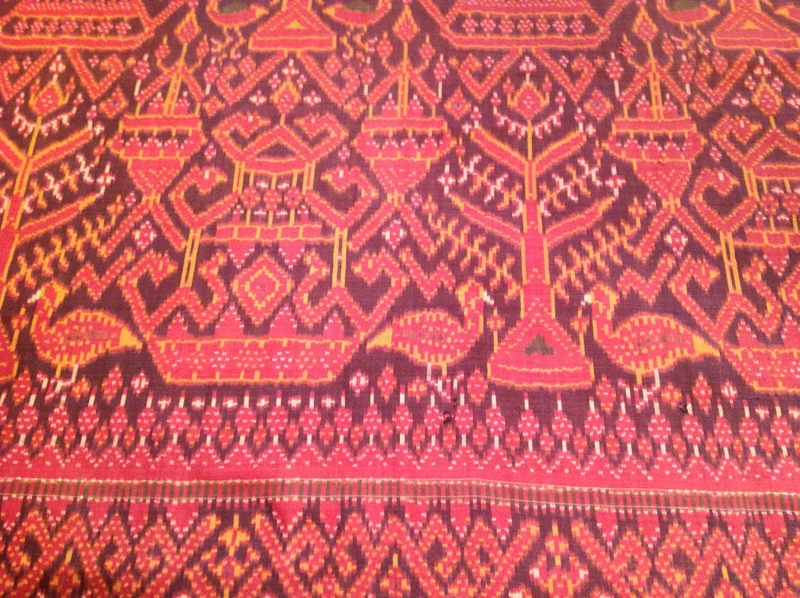 This batik is amazing, not just for the fineness of detail, which is incredible enough all by itself, but for the overlay of a paste made from gold. 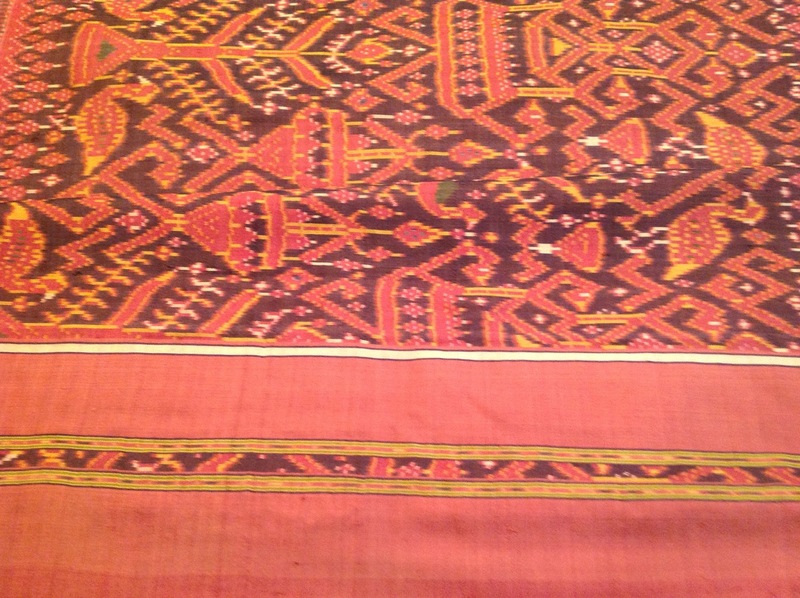 Cloth of this type is now quite rare. No doubt many examples were burned to recover the gold at one point or another. The photo shows both the back side (foreground) as well as the right side and that gleam is, indeed, the gold decoration. As we drove to the airport Winnie pointed out that I had only seen the contents of three of the drawers housing her collection. I may have to return! We live in Amazing Times. If you were born before 1960, did you have any conception of the ability we have to connect on line? I certainly didn't. Yes, I knew about computers, but internet? World Wide Web? Stuff of Science Fiction! So when I ask about on line learning, I am not proposing to do away with in person opportunities to learn. An on line seminar (webinar?) will never, in my opinion, (or at least not in my lifetime) replace that entirely! I know that not everyone can utilize the internet for things like webinars, or even You Tube video clips. I only got a fibre optic connection to the internet very recently. Prior to that it was a dial up connection and slow and clunky, and I could not have dreamed of participating in anything like a seminar on line. However, there are also a lot of people who cannot, for whatever reason, attend workshops, guild meetings, conferences. On line seminars could be a way for them to increase their knowledge remotely. I have not been successful with Weavolution. 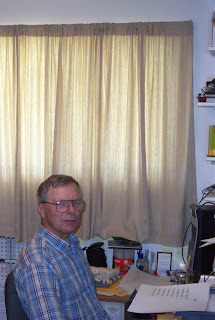 I could not get my computer to work with their technology and I was left with only the 'chat' option to communicate when I tried to do an open house when they first introduced their learning opportunity. So I was hesitant to pursue that further. However, I have been working with Interweave (one of the up coming projects which I feel I can now start to discuss because we have an air date). The Interweave webinar is a Power Point presentation with live audio in it's first iteration. Several days after the original air date all registrants will receive a link which will allow them access to the presentation for 3 months to view as often as they like during that time. Therefore you do not have to be physically present for the original air date. The moderator will collect questions and present them to the leader so there is some ability to ask questions during the live presentation. Since my lecture A Good Yarn is already in a Power Point format, this is the one I will begin with. Now, when I am doing this subject live (as I have done now for the past few years, initially as an overhead transparency format, now Power Point), the slides are merely a bullet point presentation of the material I am lecturing about. However, on the internet with only the slides as the visual, that might tend to get a little under whelming visually so my challenge as leader/presenter is going to be to re-tool the Power Point presentation to make the visuals more interesting and rely much more heavily on the power (if you will) of my vocal presentation to keep interest going. I do not anticipate that this seminar will be anything more than a pale substitute for a guild program. After all, when I'm doing a guild program I am there, live, to answer questions and my samples to pass around! But if you can't attend a guild meeting, can't afford a conference to take this seminar live, but you still want to get the information? This seminar might be just the thing that gives you sufficient information to carry on to learn more. I will certainly be adding a bibliography for additional resources at the end of the presentation. On line seminars are not intended to be 2 day workshops. They are just another tool in the student's tool box of methods of learning. Stay tuned for details - time/dates, etc. 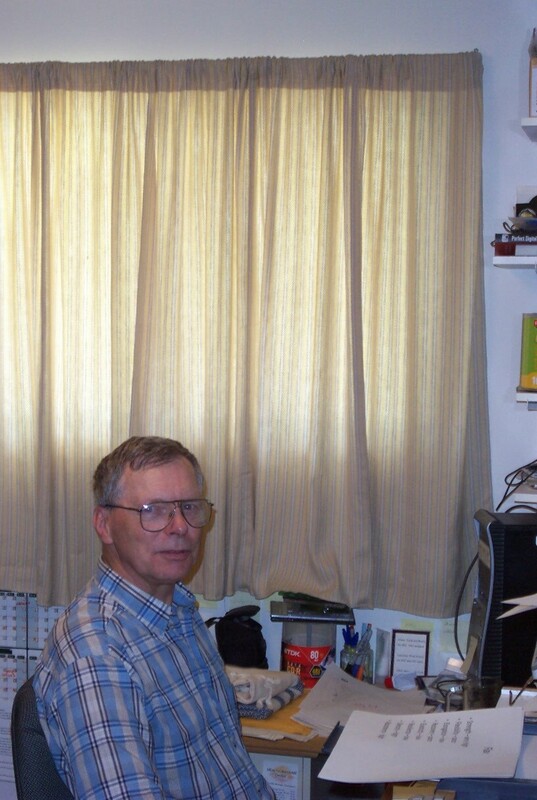 Recently Daryl Lancaster blogged about her on line seminars via Weavolution. I have not travelled to teach nearly as much as she has, but have certainly experienced my share of travel delays, time zone changes, and the general stress of modern day air travel. As an instructor, doing more on line teaching is becoming more and more appealing. What I would like to know is, do students feel on line learning is a viable alternative to learning in person? One of the common themes about conferences is the expense. And the 'bad' beds in college dorms. Winnie dropped me off at the hotel in time to meet the judging team for dinner. We had a chance to get to know each other, relax a bit and get some organizational items addressed for the task on Thursday of judging the fashion show entries. The organizing team had everything set up, a system in place and our job was to examine the entries and try to quantify them for the awards. And there were plenty of awards! The three judges were compatible with a varied enough background that at least one was knowledgable about each technique being presented that we could consult about any perceived issues and the assigning of awards went fairly quickly. But there were 60+ entries so the jurying literally took all day. Any judge/juror worth their salt will carefully consider each entry and I can confidentially say that we did. There are many reasons for entering a juried show. There are the awards, of course! And there were lots of those, too. We agreed to spread the largess around, as much as possible. Another reason for entering a juried show is for the considered opinion of the judges. It is a way to get constructive feedback from the collective wisdom of the pool of judges. Whether or not you agree with their assessment you will get feedback, one way or another. In this instance one of the judges did a seminar sharing her thoughts (and no doubt some of the discussion we all had) with the participants. It was an opportunity for the participants to get in depth feedback, not just on their own entries, but on all of them. A great way to learn in a very short period of time. When entering a juried exhibit you have to be prepared for the jurors to notice and comment on those tiny little 'flaws' that every piece has. Noticing them allows the judges to separate two very close items, adding up those tiny little issues to see which has the fewest so that awards can be granted. 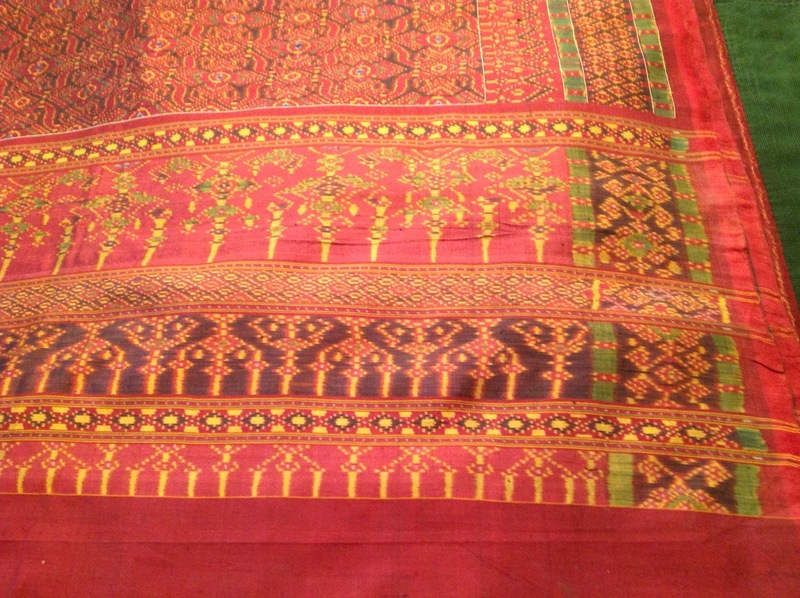 Entering a fashion show means that weavers should keep in mind that a garment will be seen at a distance as well as close up. Jurors will consider distance impact, which tends to be a lot more dramatic than an intimate scale, as well as interest close up. A garment that 'works' at both an intimate as well as at a distance is going to be deemed more successful than one that only works at either, but not both. Essentially judging boils down to personal opinion, but by and large, a reasonably educated opinion. If you receive feedback that you don't agree with, remember that it is *just* an opinion, after all. It has been great meeting some of the people I've had contact with only on the internet, being able to see 'old' friends and make new ones, and last but not least touch some lovely textiles. Margo Selby's presentation this evening was interesting but even better, she let us handle her textiles. Today the seminars started at 8:30 ending at 11:30 with a break for lunch. Then I set up the room for topic two and the afternoon session. A late lunch, then over to the college so I could check in, and register at the motel. She will come back to fetch me on Sunday. If there is time we may go to Lowell to see the textile museum there, but we will see if that fits into the schedule. Had dinner with the jury crew. There are more than 60 items so the expectation is that we will be all day at it. I'm hoping for fresh fruit at breakfast so I can take a banana or something for later. One of the weavers at dinner offered to drive me and my stuff to the college first thing in the morning, so I'm looking forward to getting that dealt with. Thankfully the temperature has dropped a bit but the humidity is high. I'm hoping it doesn't get too hot. Looking forward to seeing the entries tomorrow. For now it is time to go to bed, hopefully to sleep. 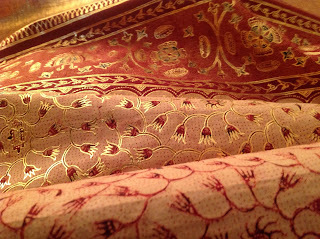 Winnie has a marvellous collection of textiles from Southeast Asia. I took a few photos but trying to load them onto the blog isn't easily accomplished with the iPad so I will post them when I get home. Tomorrow Winnie will drive me to Northampton, with a detour to WEBS. I can check to see if they have some of the brass hooks I favour for threading and sleying. Normally I bring a bunch to sell to my students at cost, but I can't sell anything so I only have one to demo with. I could have brought one for each and charged a material fee, but not everyone will want one, so I didn't. After a nice relaxing day it is nearly time to get into gear and get ready for the weekend. 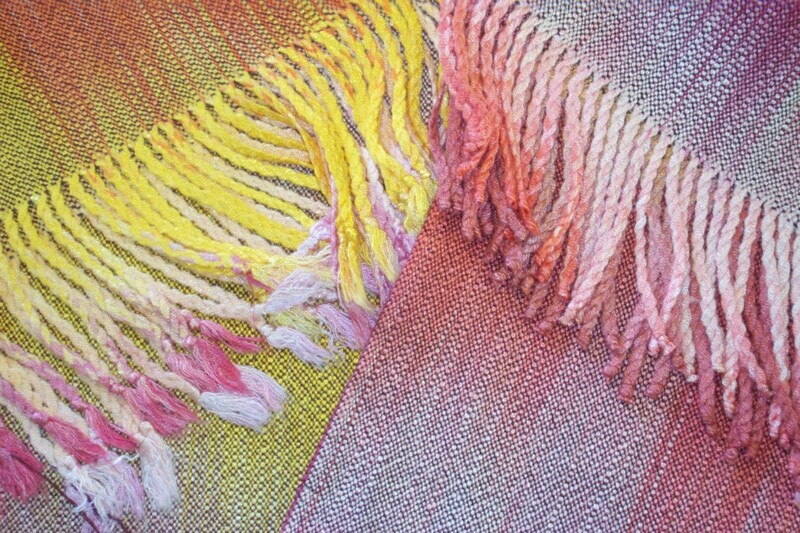 Really looking forward to meeting some 'new' weavers and seeing their textiles in person. One of the delights of travelling! The weather has so far co-operated so I'm hoping for a smooth flight. Finally found a vendor with bananas and bought two for the flight. I only have about 90 minutes in O'Hare although it looks like I am at least in the same terminal for my connecting flight. So often it is a mad dash with barely time for a potty break! Air travel especially seems fraught with people who are tired, confused and cranky. And this time of year many more children because school is out. I think every time I come through YVR the procedure changes! By the time I get home I think plans for one of the pending projects I've been working on will be far enough along that we can make an announcement. Another has been postponed, thankfully, as there were just too many deadlines coming too quickly. I'm much happier having more time to properly develop that one. While I have made good progress on the painted warp front there are still at least 10 more warps to weave to get a good colour selection, the sample warp on the AVL to do, place mats and towels to make before the craft fairs start in mid-October. And two more trips between now and then in addition to this one. My flight leaves at 7 am to Vancouver, then to O'Hare and finally to Boston. It will be a 13 hour trip plus the 3 hour time difference at the other end. Today I'm trying to tie up a few loose ends, leaving some things for when I get home because I just can't cope with them right now. Like my GST return, which means balancing 3 months worth of ledger entries - which haven't actually been entered - yet. I made some last minute decisions about what I was going to bring with me - and what I wasn't. I'm staying at a hotel so I'll have a/c, which means I ought to be able to sleep in the heat/humidity. But that also means a fairly substantial walk to and from the campus. Which wouldn't be terrible, if I didn't have all the teaching stuff to lug. I'm keeping fingers crossed I can move into 'my' room on Thursday evening so that I can get set up and ready to go for the 8:30 am start time. I'm teaching four sessions, back to back, but at least only two topics. Hope my voice lasts. This time I'm going to remember to have some water! Since I had to cancel my participation at NEWS two years ago, I'm really looking forward to being there this year. I'm hoping to finally meet, in person, some people I've gotten to know via the internet. 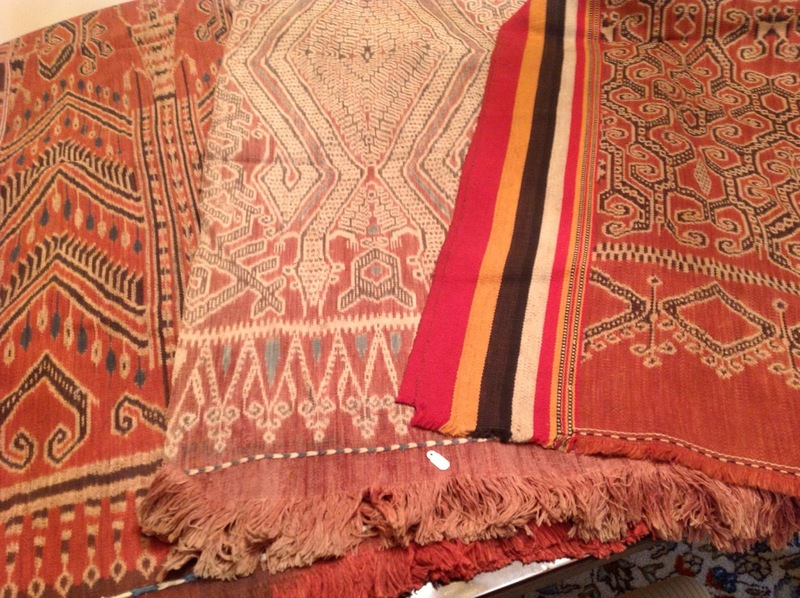 I am also looking forward to seeing my friend's textile collection - things that she purchased while she lived and worked there, eventually learning to weave so she would have a better understanding of how the cloth was created. 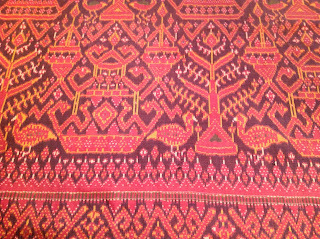 So I'll be spending my birthday delving into some lovely textiles that I would never otherwise have had an opportunity so see in real life. Can hardly wait! And then I will come home to a warp partly on the AVL, and another scarf warp beamed but not threaded, etc. There are days when I feel the need for a clone, but she'd probably start thinking up even more stuff for us to do! 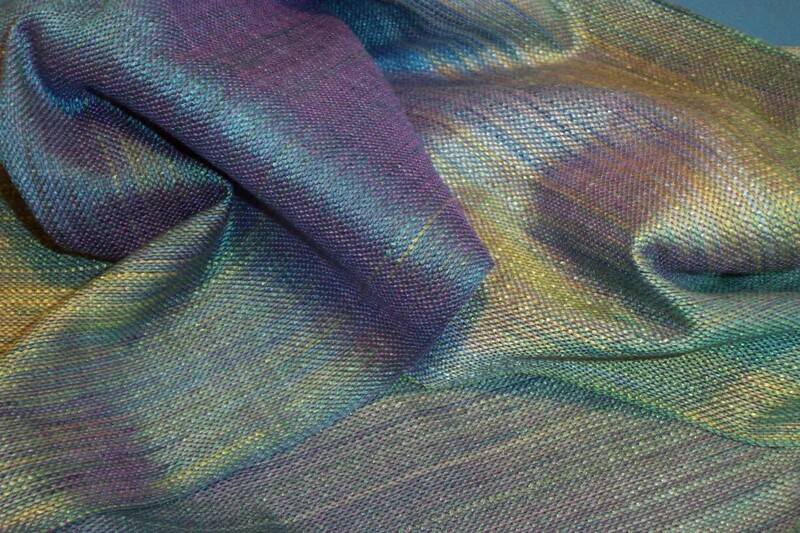 I think this photo shows off the iridescence in scarf #83 quite well. As usual, click to biggify. The scarf isn't wet finished yet, and I am hoping the iridescence intensifies after a good hard press. I didn't sleep well again last night. For so many years I slept poorly that I've been rather enjoying the fact that 9 nights out of 10 I do actually sleep. Last night appears to have been number 10 and it took ages to get to sleep so today I'm sleep deprived. Therefore I'm beginning to really feel the stresses and strains of the last while. The only 'down' time I've had this year were the 3 days after a trip when my back went 'out' on me and I was literally forced onto my back to let it rest. So I am thinking that the weeks between Boston and my departure for Departure Bay I'm going to have to crank back the dial and not set my daily goals quite so high. Because as soon as I get back from the August trip I will be back to looming critical deadlines. On the other hand, if I don't work at least a little bit during that three weeks, it will make the pressure in September and October even worse. So perhaps any sort of 'holiday' will have to wait until after John C. Campbell in January, after which I will go to Florida to visit with friends there for a few days. And this time, Doug will get to join me there. Perhaps there is good reason for my calendar next year to be so empty? 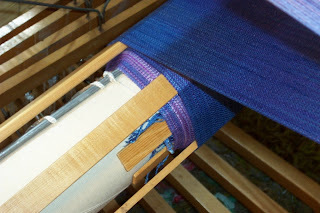 Registration for Weaving Boot Camp should open in the next week or so. Check the folk school website for details. When I began this blog almost 5 years ago, it was by way of being a celebration of returning health and weaving. It is never easy to run smack into the destruction of the myth of good health and immortality. The first time I truly came to the realization that we are mortal was the death of my father when I was 25. My reaction to his dying and eventual death was to completely turn my life around and commit to becoming a professional/production weaver. While I grieved for the loss of my father, the loss of innocence, if you will, and came to grips with the fact that if we don't live life while we have it, I studied the construction of cloth and how to enter the marketplace with what is, to all intents and purposes, a luxury item. Over the years I 'forgot' about the reality of aging and the loss of health. I lived a healthy lifestyle. Ate healthy foods (within my allergies), got exercise (yes, weaving the way I do it is aerobic), stayed active within my community and assumed I would continue to live this way for at least 30 more years. Until the next reality check - my brother's death, my subsequent discovery of more health issues lurking than I'd suspected. Once again the myth of health exploded, not once but several times in succession, along with a dollop of other things like a broken ankle, adverse drug reactions, etc., etc. So while reality has intruded, it has also given me the gift of seeing what is really important in my life. It has given me the incentive to say 'no' where appropriate, and 'yes' when it is. It has made clear my priorities. I am able to stand back from the general melee and choose where I invest my dwindling time and energy. Instead of carrying on doing what I'd always been doing, I am able to step back and decide that no, I'm not actually going to continue to do that. In many ways not knowing when our 'end date' is going to occur is a blessing. We can continue to ignore the fact that we are mortal for much of the time. We plan on doing things one or two or even three years in the future, confident that we will actually be around and in shape to do them. But deep down, while I plan to be around for a good long time yet, I also know that there are no guarantees, that none of us gets out of here alive, that eventually the clock will wind down. 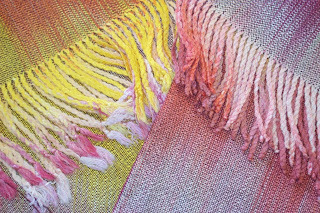 Living life is a lot like weaving these painted warps. The future is hidden, what is coming isn't known (although it can be predicted somewhat), things change as it goes along, but always, it is beautiful. Seriously. I totally meant to take a bunch of pictures today and we got so caught up in making 'not white' that the thought of actually documenting the day completely fell out of my head. It all came back to me, just how done I am with dyeing on any kind of scale. The lugging stuff up (and then back down) the stairs to the guild room, the heat, the humidity, the dealing with huge pots that weigh a ton, etc. etc. I think I've got one or maybe two more dye days and then everything in my stash will be 'not white' that I need to be 'not white'. But first the yarn has to be skeined and tied and a day found to - yes, lug everything up the stairs, deal with heavy dye pots, standing at the sink rinsing, rinsing, rinsing. Obviously I'm not a dyer at heart. I'm just doing it so that my yarns (and/or cloth) is....not white. So, Happy Birthday office. Nearly. It's not a pretty sight - it's a very quick-and-dirty job, nothing to brag about, certainly wouldn't earn me any gold stars in sewing class. But I do know enough about curtains having worked in a custom drapery house, to hang the curtains for a while to let any stretching that is going to happen, happen, before hemming. I rather suspect that they are going to hang for a very long time before I next get a round tuit. Anyway, that's my story and I'm sticking to it! This afternoon I'll finish the apron so that it can be installed for the new warp, plus there are two small demo warps to be wound for NEWS. Then the suitcase will be unpacked and re-packed for NEWS as well. I'll put all my Magic teaching stuff into the bottom, then the day before I leave (one week from today!) the stuff for The Efficient Weaver will go in along with my personal items. I noticed recently that some airlines are changing the maximum size for carry on luggage so I'm going to try to get friendly with my new, smaller, carry on bag and get used to having less actually with me and more in my checked bag.